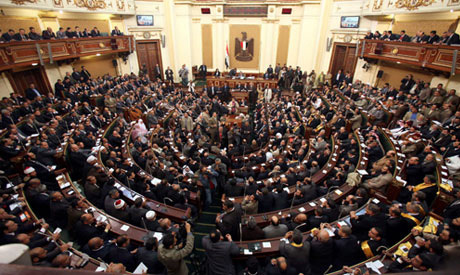 The Telecommunications and Information Technology Committee in Egypt's Parliament began discussing on Tuesday a new government-drafted law aimed at combating cybercrimes which negatively affect the country's national security and internal stability. Head of the committee Nidal El-Saeed told reporters that the bill was jointly prepared by the ministries of justice and telecommunications and information technology. El-Saeed explained that in its first meeting on Tuesday, the committee had concluded debating ten articles of the new law. "The discussion was held in the presence of representatives from 19 ministries, particularly the ministries of interior, defence and telecommunications and information technology, because of the strategic importance of this bill," said El-Saeed. Kamal Amer, head of parliament's defence and national security committee and the former chief of Egypt's military intelligence, also told reporters that "the new bill will stand up to the growing dangers of extremist and militant Islamist movements using the internet and modern technology to carry out terrorist attacks," said Amer. "The internet has now become a major tool in recruiting extremists and launching terrorist and subversive attacks. The new bill gives powers to the interior ministry and other state institutions to track websites and social media which are involved in spreading terrorism through extremist, radical and militant ideologies," he added. Amer said the above draft law comes in tandem with other recent legislative measures that seek to fight all forms of terrorism and extremism. "It also comes to go in line with the army's comprehensive campaign against militant and terrorist groups in North Sinai," said Amer. The ten finalized articles in the new law deal with the definitions of some cyber expressions widely used such as "websites," "traffic data" and national security. El-Saeed said the committee has reached an agreement on how state institutions should be classified and defined as "national security institutions." He said the committee also discussed the definition of what is called a "digital directory," which will be used in tracking cyber and information technology crimes. Article two regulates the activities and obligations of internet service providers and how they should cooperate with national security authorities in giving all information on certain users suspected of spreading terrorist and extremist ideologies via the internet, he noted. "We discussed whether or not this article is in line with the constitution, which does not allow such practices because of its violation of personal freedoms," said El-Saeed. "Some committee members want the revelation of private statements of internet service customers should be allowed only upon a judicial order. But others insist that internet service providers should make all information available to national security institutions and investigation authorities," he explained. The committee chair indicated that it was agreed that investigation authorities will be authorized to shut down certain websites or links whenever this is technically possible and whenever there is a strong evidence the website is involved in spreading criminal activities that pose a threat to Egypt's economy and security. Article eight gives customers or service providers the right to appeal an investigation authority shutdown decision in the appropriate criminal court within seven days. Article nine states that Egypt's prosecutor-general will be authorized to place those highly suspected of cybercrimes on the travel ban list and on the arrival watch list. This decision can also be appealed before the court.